Genesis 1. – Dirty wet dog , boats and sailing. This morning while i am dealing with some admin stuff at home, boat insurance and the like , i also wanted to get one of the new blog posts that i thought about during the last trip up and out there. The title link here is i guess something to do with “in the beginning” and nothing to do with the former rock band of the same name and no : neither have i gone all biblical here. What i am doing now with my small boat and what i am about to start has its beginnings in the mid 1990’s just after the time i left professional sailing : i was sailed out having done a huge number of sailing miles in a few years, a bit like a sailor of Nelson’s era there was 18 months where i hardly stepped ashore and in one case had just come back from a circumnavigation only to be requested to start racing back in the opposite direction ! This story then starts with me coming ashore very tired and firstly needing a break from boats, i was also in a bad place financially having a bought a property just before the big financial and property market crash so i not only owned a property that i had no job to pay before but that it was now only worth about two thirds of what i had paid for it. My solution was to get a job back in the NHS which today seems like a bit of an established habit, out my head down and work hard : i continued to live in a poky bedsit on the south coast just to keep my costs down, walked or cycled the 8 miles to work and lived a tough and frugal lifestyle. I remember doing crazy things like working 10 night shifts in sequence, having 2 days off to do the shopping and batch cooking and then doing it all over again…each month just chipping away at the negative equity problem. I would say today that the situation cost me 2 years of my life, its not something that i am bitter or angry about today : its just stuff that happened and that i made as best a response to as i could. There was a positive outcome though in that during the time i had to myself which was very little in the work, eat and sleep cycle i compressed a lot of studying and thinking into the few days that i had as my own. My treat once i had recovered from a monster sleep (up to 14 hrs) and done my shopping for the next week was to head on down to the ferry over the hamble and go to the excellent nautical bookshop over at Warsash. Sometimes i would walk back around the marsh and saltings to the elephant boatyard and then hop on the train back around to the Hamble. My treat was any book about some aspect of boats, sailing, the sea or about other broader outdoors life : i remember it as the time that my outdoors interest broadened and escaped the narrow confines of the IOR and big race boats.I felt in a way that i had “been there and done that” with my triple Horn passages and the height of surfing maxi boats down in the big chilli bin. It seemed pointless to continue in that game as many of my peers did chasing ever more tenuous and arcane goals like trying to get around the world in 80 days or less. In those 2 years my thinking totally changed and what happened is that i looked at smaller and smaller adventure ideas but with a much broader base , for example the world of adventurous dinghy and small boat cruising, the possibilities inherent in the sea kayak and the canoe…ultimately it led me briefly ashore to learn and study other base genre’s such as bushcraft and survival skills. Later on that path i was very lucky to meet and study with people like Ray Mears and as largely as possible to develop a whole new skills and knowledge base which more recently i have been able to apply on the sea again and in the rivers and estuaries that i am at home in now. I did then enter a completely different stage in my outdoors life when i was much more free to explore other avenues of practice, we did for example a lot of long distance hiking in places like the high Sierra Nevada mountains and the New Zealand bush, we sea-kayaked and sea-canoed and did a long trip in the outback of northern Ontario. Ultimately i came back to sailing with a whole new mindset of adventure in all forms , much greater simplicity and a much closer contact with the ‘nature’ of water…..how simple and how minimal ? well how about stripping off and stuffing my clothes in a dry-bag and going for a long swim in live water!. Today i feel that i have achieved mental emancipation from the one single idea that i started with, i don’t particularly like big racing boats any more although i follow events such as the Vendee for the sheer ballsiness of it. 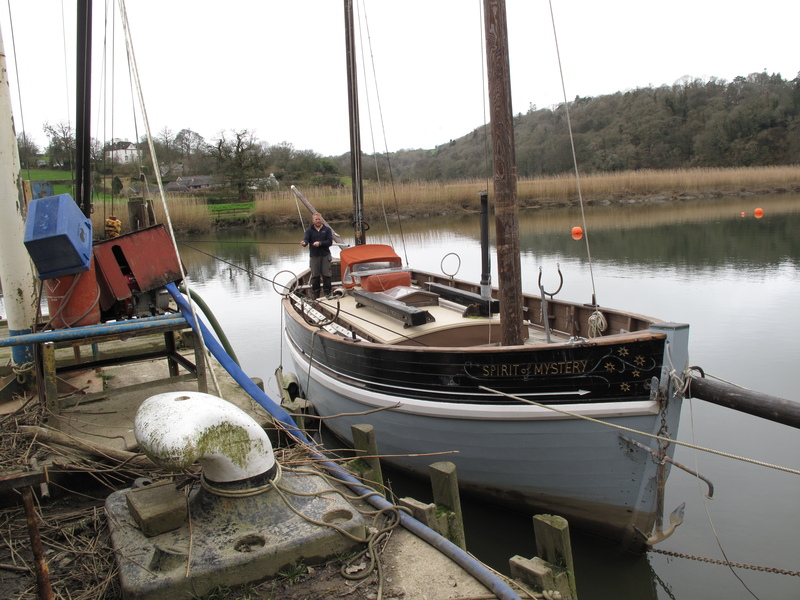 Its not just the small quirky boats that i like now : over time i will be introducing many of the other kinds of boat that i enjoy seeing, today for instance i was talking to boatyard owner Chris while he moved 38 feet and 12 tons of solid oak (Spirit of Mystery) with just a few lines and then later sat talking to a bloke painting his 50 foot and 23 tons double-ender just because it s boat i like the look of.